Clarke Animal Hospital team of skilled veterinarians welcomes you to our practice. We proudly serve the Muskegon, Spring Lake, and Grand Haven areas. At Clarke Animal Hospital, it is our daily privilege to provide quality vet care to your cherished pet, with compassion and competence. We hope to ensure a positive impact on our patients, pet owners and the local community. Dr. Falkiewicz (pronounced fall-kah-wits) was born and raised in Michigan, and developed a special relationship with animals at an early age. She received her Bachelor of Science in Biology from Central Michigan University, and graduated with honors from Michigan State University College of Veterinary Medicine in 2014. 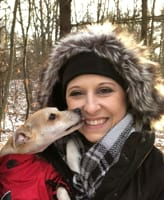 Following graduation, Dr. Falkiewicz worked for one year in a small animal clinic in metro-Detroit, and then moved to Grand Rapids with her husband who began a residency in human medicine. When she isn’t working, Dr. Falkiewicz enjoys spending time with her husband, Matt, son, Davis, and their two Australian shepherds, Chesney and Lilly. She also loves traveling, touring Michigan’s wineries, reading, and putting together jigsaw puzzles. 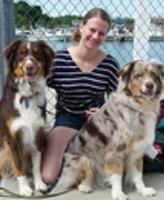 Dr. Susan Graham is a 2014 graduate of the Michigan State University College of Veterinary Medicine. 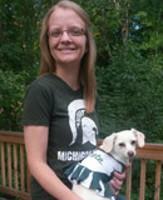 She also attended MSU for her undergraduate studies in animal science. Go Green!! She is a Michigan native and grew up in the Grand Rapids area. At home she has one rescue dog, Greta. When not at the clinic she enjoys taking long walks with Greta, knitting, and card making. Dr. Harden was born and raised in Grand Haven, MI and graduated from the Michigan State College of Veterinary Medicine in 1992. He has a strong interest in soft tissue and orthopedic surgery, and also really enjoys creating long term relationships with our clients and their pets. He is married to Lanette and they have a Bernese Mountain Dogs "Georgie" (pictured) and a crazy cat named "Izzie". He continues to be an avid MSU Spartan fan. He enjoys all facets of the Michigan outdoors including hiking, fishing, and trail running. He has run the Boston Marathon every year since qualifying at the Bayshore Marathon in 2013. 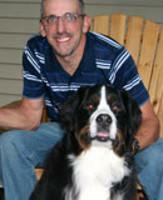 He has been with Clarke Animal Hospital for over 25 years and brings a wealth of knowledge to our team. Dr. Thayer was born in Michigan while his father attended Michigan State, he grew up in Taiwan, Australia, and Maryland. It was while living in Australia that he discovered his love for animals and his fascination with their diversity. Dr. Thayer graduated from the University of Maryland in 1991 with a degree in Animal Science. He then attended veterinary school at Virginia Tech where he graduated with a DVM in 1995. 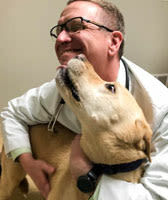 After veterinary school, he completed a 1-year small animal internship in veterinary emergency medicine and critical care at the Veterinary Institute of Trauma Emergency and Critical Care in Milwaukee, Wisconsin. Following graduation, Dr. Thayer worked for about 7 years in Emergency/Specialty veterinary hospitals. Following the birth of his first child, he changed to small animal daytime practice as the hours were more conductive to raising children. He became a stay-at-home dad for a few years after the arrival of his third daughter. Dr. Thayer has been married to his wife Dena, a local plastic surgeon for over 20 years. They have 3 beautiful school-age daughters. In his spare time, Dr. Thayer enjoys woodworking, photography, playing the banjo and meditating. Dr. Thayer’s family has an English Pointer, a lab mix rescue, 2 indoor cats, 3 mice, a rat, 2 turtles, 2 leopard Geckos and tropical fish. Dr. Katie Armstrong grew up in Michigan and received her undergraduate degree from Michigan State University. She then graduated from Louisiana State University School of Veterinary Medicine in 2016. It was there that she met her husband, fellow veterinarian, Michael. After graduation, she practiced in Texas for a few years before returning home to beautiful Michigan. She currently has a dog named Lila and a three-legged cat named Roux. In her free time, she enjoys being with her family and outdoor activities such as hiking, biking, and spending time at the beach (when it’s not covered in snow and ice! ).